The European dream continues as Manchester United advance to the Round of 16 of the Champions League after beating Young Boys 1-0. It was far from a perfect performance, and a David De Gea save kept United in it, but a last minute winner from Marouane Fellaini was enough to get the job done on the day. The starting lineup named by Mourinho was interesting, to say the least. Smalling was the only defender to keep his spot in the starting XI, as Jones, Valencia, and Shaw came into the side. Fred made his returning to the lineup, coming in for Pogba in a midfield trio including Fellaini and Matic. Rashford got the start up top, and was flanked by Martial and Lingard. Some of these changes might have been made with next weekend in mind, as Mourinho might’ve decided to try and save his bigger names for the Premier League match against Southampton. The stream cut out for a bit at the pub I was watching the game, but replays showed that Rashford failed to convert from close range. 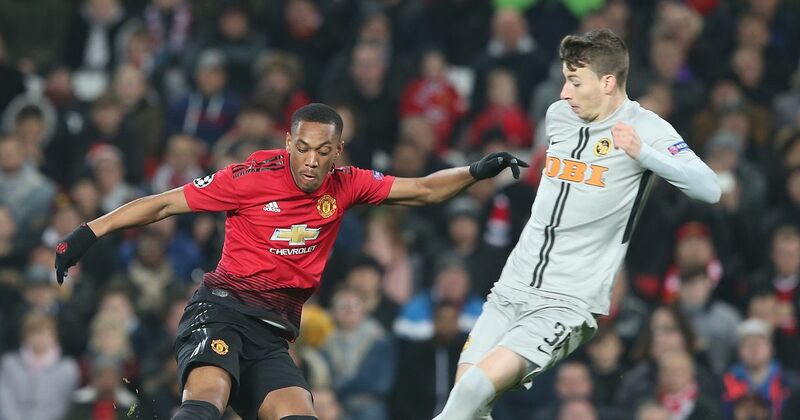 An early chance fell to United when Martial dragged defenders out toward the wing. He found Fred on the edge of the area, who smashed a shot, but saw t fly well over the bar. The home side almost took the lead out of sheer luck, when a Fellaini cross deflected toward goal at pace. The Young Boys keeper was alert, and was able to corral the ball on a second attempt. United controlled the game like many expected, but couldn’t grab the opening goal after some good play. A clever give and go from Rashford and Fellaini saw the Englishman through, but he bottled the chance, and hit his shot right at the keeper. It would be Rashford once again getting involved, and he did a bit better with this chance. Picking up the ball from more than 25 years out, the youngster rifled a low shot towards goal. Unfortunately, it bounced just wide of the far post. The opportunities kept coming, and the home side kept failing to covert. A long free kick by Fred picked out Matic, but the Serbian tried to bring the ball down, and lost out to the ball to the Young Boys keeper. It ended up being for naught, as he was flagged offside anyways. Rashford would get on the end of one more move before the end of the half, but just like with every other chance that fell to him earlier, couldn’t find the net. The angle was tight, and Rashford looked to smash one into the roof of the net, but instead hit it miles over. The last chance of the half remarkably fell to Young Boys. Low cross picked out Sow making a late run into the area. The midfielder went for a cheeky flicked finish, but saw it hit the side out of the near post. Although more chances were creates this time out, the Old Trafford faithful were frustrated with the fact that the team had failed to score in the first half once again. Near the hour mark, fans got to see one of the oddest moments of the season. A high ball flew into the area, and the Young Boys keeper came out to easily claim it. Lingard screened him, and clearly fouled him, but the referee kept play going. With the keeper out of position, the ball fell to Fellaini, who smashed it over the bar from a few yards out even though there was no keeper. Simply unbelievable scenes. Phil Jones then hit a cross so high into the night sky that amazingly went out for a throw in. Mourinho made a big double substitution with 30 minutes to go, as Paul Pogba and Romelu Lukaku came on for Lingard and Fred. The Frenchman made an immediate impact, dancing past the Young Boys defense before laying off a pass to Rashford on the edge of the area. It fell onto his weaker foot, however, and the shot flew wide of the target. David De Gea then proved why he’s the best goalkeeper on the planet today. After a corner wasn’t cleared properly, a shot came in from a Young Boys player. It bounced off two players in the area before heading toward the bottom corner. Incredibly, De Gea was able to react, and make his way over to stretch a hand and make the vital save. Give him all the money he wants. The last change of the game by Mourinho came with 15 minutes to go, as Juan Mata replaced Valencia. Man U started to play very direct. A long ball into the box by Pogba flew to Fellaini, who headed it back down. It bounced to Mata, but he snapped at it, and volleyed it well over the bar. Pogba played another long cross moments later, which found Smalling, but his header was right into the side netting. Just as it seemed like hope was lost, Marouane Fellaini stepped up to play the role of hero. An aimless long ball was flicked on by Lukaku. It fell to the feet of Fellaini, who did superbly well to settle, turn, and rifle a shot into the lower corner. Old Trafford erupted, and Mourinho celebrated by slamming some bottles on the touchline. It was far from pretty, but United got the job done, and clinched their spot in the Round of 16 of the Champions League. Manchester United’s next game is on Saturday against Southampton.